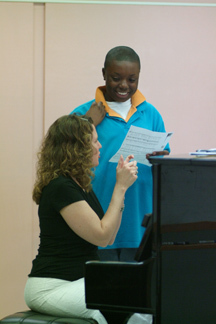 American Festival for the Arts (AFA) was founded in 1993 with a mission to provide music education and performance opportunities for youth and to broaden the audience for American works and classical music. 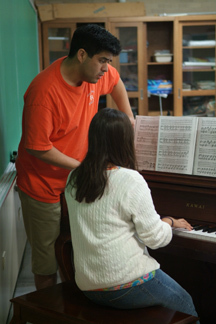 Since 1996, AFA has presented an annual Summer Music Conservatory and Concert Series. In keeping with our mission to broaden the audience for American works, AFA is proud to have presented 130 concerts from the 1996-2005 concert seasons. In those 130 concerts, AFA students and faculty have performed 915 works from the classical music repertoire. Of those 915 works, 332 of them (36.0%) have been American works. Of those American works, 97 (10.6%) were world premieres of new works by members of the AFA composition department, students and guest composers. Since 1998, a new aspect of AFA’s mission has been to maintain 30%+ American Works and 10%+ world premieres for each concert season. With the addition of an AFA Middle School program and AFA Choral program in 2003, we have increased our numbers to as much as 40%+ American Works and 11%+ premieres in the 2004 season and beyond. This link is important because the study and performance of new works, associations with visiting composers and interactive experiences with outstanding musicians provides for the most fulfilling understanding, appreciation, and "living" connection to America’s rich classical music heritage. As a result, AFA concerts that include new American works are often programmed with the participation of the composer in mind. AFA is proud of our record of premiering new American works and to be the premiere presenter of both American works and world premieres in the City of Houston. For more information, please contact AFA. AFA was very excited that, as part of it's tenth anniversary celebration in 2005, it commissioned six Houston and AFA related composers for new works that premiered during the 2005 season. AFA is strongly committed to the commissioning and performance of new music and is proud to be able to feature the following artists during the 2005 season. If you would like to hear any of these works, please contact us for a complimentary copy of a CD of these works. J. Todd Frazier: Co-Commission with the Texas Music Festival. A new orchestral work, "We Hold These Truths..." that was performed by the AFA orchestra and the Texas Music Festival orchestra. Performances took place on June 25th at the Moores Opera House (performances by both AFA and TMF) and on June 26th at the Julie Rogers Theatre in Beaumont. Robert "Doc" Morgan: A new work for big band, "Salud", based on the themes of Todd Frazier's music, that was premiered by the AFA Big Band on June 29 at Birraporetti's and June 30 on AFA's Showcase Concert at Episcopal High School. 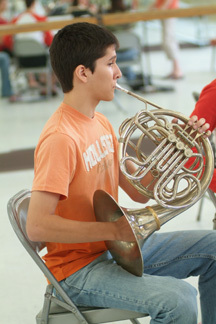 The work has since been performed by the HSPVA Jazz Orchestra. Chris Theofanidis: A new work for string orchestra, "Mare Chiaro" that was performed by the AFA String Orchestra. Performance on June 30 during AFA's Showcase Concert at Episcopal High School. Joel Stein: New cello duo, "In These Times" that was premiered by AFA faculty cellists Nathan Cook and Steve Laven at AFA's Faculty Showcase concert on July 9, 2005 at the Lawndale Arts Center. David Ashley White: A new choral work, "Songs from Old Plum Grove" that was performed by the AFA Mixed chorus on July 14 at Episcopal High School. This piece will be published by AMC Music in 2006. Michael Remson & Stanton Welch: A new ballet, "Collapsible Rhythms" for performance by students from the Houston Ballet Academy and AFA sloists. The premiere took place on July 15 at AFA's World Premieres Concert at Episcopal High School and was subsequently performed two additional times by HBA during their final showcase concerts at San Jacinto Community College South on July 28 and 29.